Almost every year, without fail, our family heads to the beach for vacation. This summer we were excited to stay at a new-to-us beach in North Carolina – Ocean Isle. It was beautiful! I have no doubt we’ll go back. One of the draws to this particular beach was its proximity to our usual summer beach haunt, Myrtle Beach. Our boys have grown up enjoying Myrtle Beach and all it has to offer. We have many traditions in Myrtle Beach – eating at Simply Southern Smokehouse so we can listen to Isaac sing Southern Gospel as he buses tables faster than anyone we’ve ever seen, bumping and racing each other around the go-kart tracks at what is now called the Broadway Grand Prix, trips to Krispy Kreme when the red light is on, and scouring the two outlet malls for bargains. Our boys, now 19 and 16, usually approach these traditions with wild abandon and leave elated and fulfilled. Our trip to eat at Simply Southern and the following battle at the Broadway Grand Prix wasn’t as satisfying as usual. Both experiences were just “okay”. Not bad, but not as much fun as they used to be. We decided as a family it was time for us to make some new memories and let go of some of our familiar traditions. We’ll still vacation at the beach, but we’ll explore some new restaurants and activities next time. I couldn’t help but think about the women’s ministry events and activities that have become an annual tradition in many of our churches. Maybe it’s the Mother’s Day Tea, a long-running joke at the fall retreat, or a Christmas banquet. Over the years some traditions become less fulfilling. New members don’t understand the inside jokes and feel left out. The audience ages as most of those younger fail to embrace what has always been the event of the year. 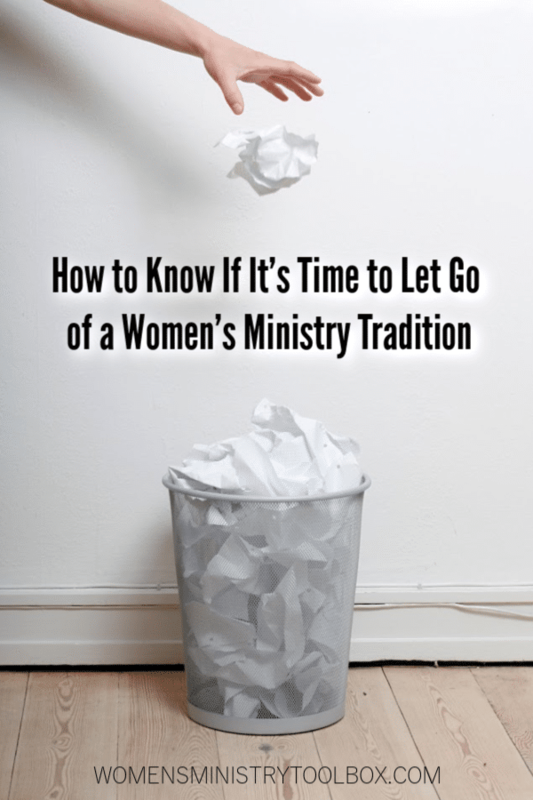 How do we know if it’s time to let go of a women’s ministry tradition? Prayerfully consider the answers to these questions. 1. Has attendance fallen for this event or activity – either in whole or by age group? 2. Has this event followed the same schedule (maybe even the same speaker) year after year after year? 3. Is this event/activity one that takes a significant portion of the women’s ministry budget? 4. Is the enthusiasm for this event starting to wane? Look closely across the generations. Ask a variety of people that will give you an honest answer, and not just tell you what they think you want to hear. 5. Are Jesus and God’s Word the focus of this event or has it become (or always been) something else? Building community should definitely play a part, but has Jesus failed to make an appearance? 6. 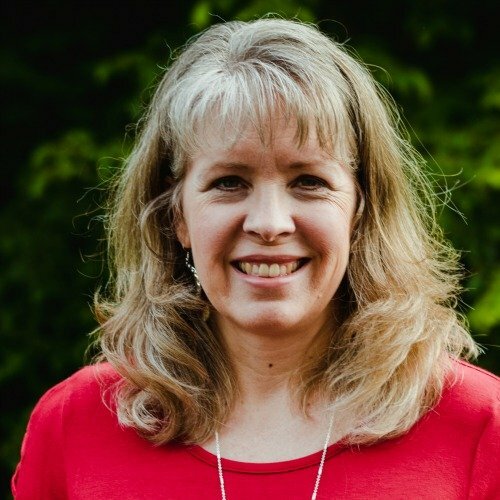 Does the event/activity still align with your women’s ministry mission statement and the church’s mission? If you’ve recently revised or created a mission statement, now is a good time to check and make sure every event supports that mission. 7. Does this event/activity draw in a significant number of guests and do they return for other women’s ministry events or church services? If you’re not reaching women outside your church walls that’s a problem. If women are only coming in for this one event and not coming back for anything else you need to examine why. 8. Is the same woman coordinating this event year after year? While I understand she may do a stellar job, sometimes events need a fresh injection of ideas and/or energy. A different perspective can make all the difference in an event that’s starting to show it’s age. 1. First, before doing anything – spend time in prayer over this decision. You must be confident that the Lord is bringing this event/activity to an end. Write down why you feel this is the direction the team should go. You’ll need to be prepared to explain your reasoning to your supervising Pastor and your team. 2. Secondly, don’t be a lone ranger. This needs to be a team decision or your ministry could be negatively impacted. 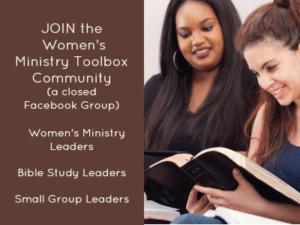 If you feel confident this is an event or activity that does not serve the purposes of your women’s ministry, take the time to help your team reach that same conclusion. Use the questions listed above. Have your team complete a Ministry Health Assessment. Use the Post Event Evaluation Form. 3. 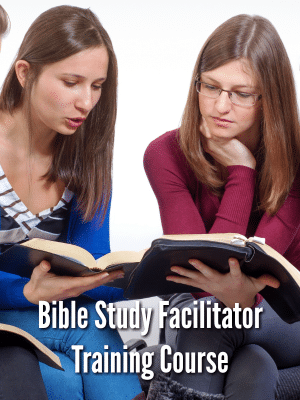 Speak with your supervising Pastor. You want their input and their backing. Some may even use their authority to press pause on the event. 4. Try making a change, before giving an event the ax. Change the schedule, change the location, or change the emphasis. Don’t change everything at once. Make incremental changes over several years until the event becomes what you feel God is leading it to be. 5. Consider hosting the event in alternating years. This can be especially beneficial if the event/activity is a drain on the women’s ministry budget. When women see what else can be done with those funds, they might not hold on so tightly. 6. 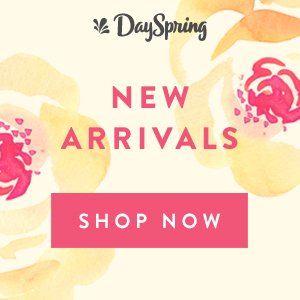 Cast a new vision for your women’s ministry. Once your team is on board, it’s time to share that vision with other women. Reach out to those with the greatest influence and spend time addressing any of their concerns. You may just find they are excited about the new direction in which God is leading! 7. Expect pushback. Many of your women will resist change and won’t like anyone messing with an event they dearly love. Be kind, but firm. Draw their attention to the positives of any changes your team may have made. If you’ve pressed pause, assure them the team will be praying and seeking God’s will. Several years ago I tried to bring an abrupt end to the Secret Sister program at a church in which I served. For many years a small number (between 20 – 30 women in a church with a weekly attendance of around 800) of mostly older women (60+) in our church participated in a Secret Sister program. They would purchase small gifts and send cards to their “secret sister” for most of a year. In the spring there was always a big reveal lunch/brunch for the group who had participated. The budget for the reveal brunch ($300) was more than the line item for events that were for ALL of the women in the church. Women could only join once a year which excluded anyone new from joining. Some participants failed to participate – you could love on your secret sister but receive nothing in return. Our younger women were not interested in the program (we were focused on increasing their participation). It was inward focused – rather than outward focused. It’s been many years, so some of the details are fuzzy, but I do recall that I didn’t do enough to address my concerns before omitting the program from the budget proposal. I failed to follow the above steps and suffered the consequences. When I explained to the team my concerns, emphasizing that I did not feel $300 on an event that only about 20 women participated in was in line with the rest of our budget, a couple of team members were quick to find ways to cut the cost of the “reveal luncheon.” In the end, they decided to charge each woman $10 for brunch, and it was decided we would draft a letter (to be reviewed and approved by our Pastor) to all of the participants letting them know we would be suspending the secret sister program. It was a difficult meeting, and I left feeling like I had made some enemies that day. It was the right decision, but I went about it all wrong. I pray you won’t do the same! My prayer for you: Lord, give us discernment when it comes to events that are a tradition in our women’s ministry. Help us to know when we’ve strayed from Your purpose. Give us the insight to make any necessary changes. Prepare the hearts of our women as we seek to do Your will. But did you tell them about Me? One year ago: Icebreaker Game: What’s on ur phone? Jacqueline, I don’t have a copy. I’m sure if you searched online you might find some guidelines. Honestly, it’s not something I recommend. Stephanie, good question. I think you’d first need to determine what’s the purpose and make certain that you set up guidelines that reflect your purpose and line up with your ministry’s mission statement. It may be that “prayer partners” or “encouragement partners” better reflect your goal. Or perhaps instead of focusing on women in the church, you adopt women outside of the church – teachers at a local school, first responders, neighbors, etc. Honestly, most of us don’t really need little gifts, but we all need encouragement and prayer. Perhaps you could plan and organize random acts of kindness (RAOK) in your community – spreading Christ’s love as far and as wide as possible. Pinterest is full of RAOK ideas. I’d suggest making it a matter of prayer. There are so many things we “could” do, but what does God want us to do that ultimately points women to Christ and brings Him glory? Thank you for this! Speaking of Secret Sisters, a newer, younger member just brought this up to me. It’s something we’d done away with years ago. I told her I would prayerfully consider her request. Do you have any suggestions on how to have this ministry successfully? Many of the reasons you listed are why we stopped it, money not being one of them. I’d appreciate your thoughts.